They must be having a war daddy! So my son surmised at the site of nine ships jockeying for position on Lake Superior today. Indeed, they cast the appearance of a mighty armada preparing to bombard the Duluth harbor. These were lakers at about a thousand feet a piece, so that’s nearly two miles of freighters that were anchored (blocked by sea ice that floated in during our Nor-easter that made the shipping canal impenetrable until the coast guard icebreaker busted a way through). Made me want to play Battleship. 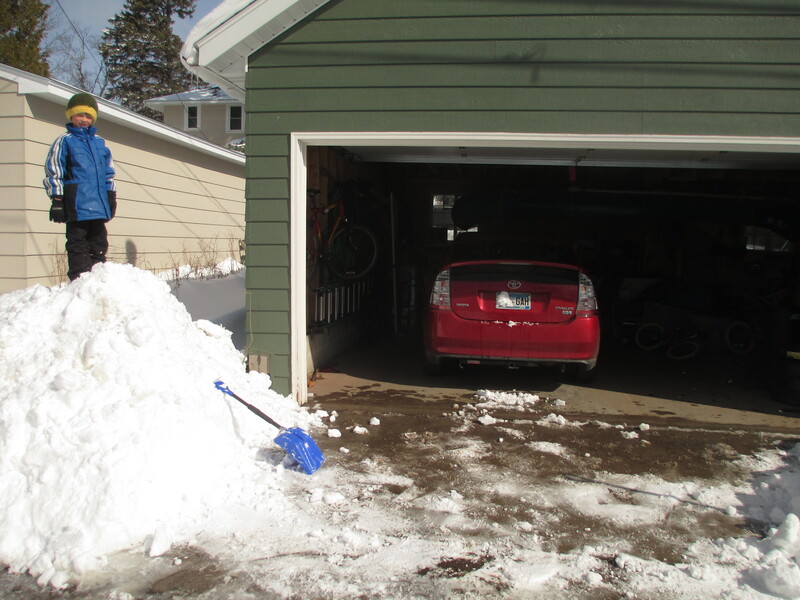 To get out there my son and I had tons of shoveling to do. Today was the eye of the hurricane. Another storm arrives tomorrow, and since our food and patience was nearly exhausted, it was critical that we get out for food and recreation. If you squint real hard you might see the 1929 Old Town canvas canoe hanging from the rafters. I dream of re-canvassing this old beauty, and then taking it up to the Boundary Waters to sail on some of the large border lakes like big Saganaga or Seagull Lake with friends. It comes with a mast, sail, and outrigger for stability. Rather than paddling all that big water it would be something else to just let her buck with the sail if the winds were favorable. Of course I know virtually nothing of sailing. Details details…. Just dreaming of spring. 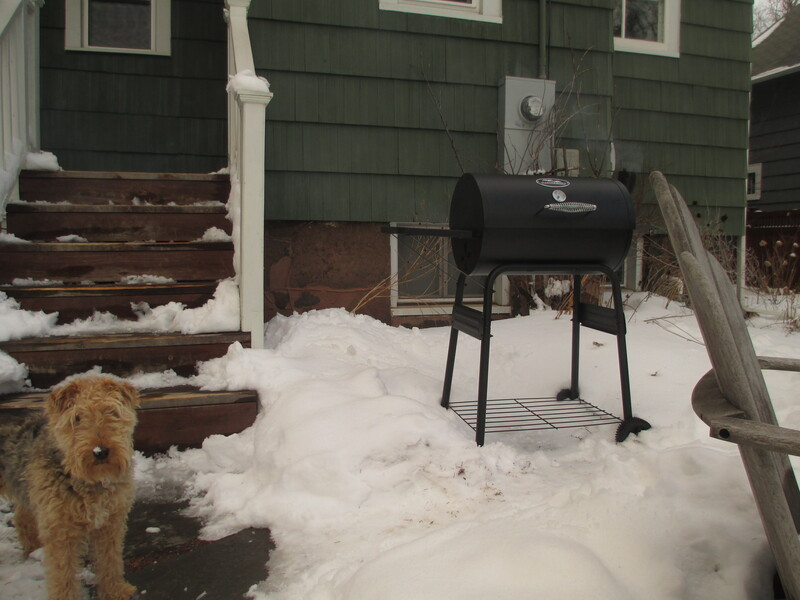 I find a little grilling helps avoid the extended winter blahs too…. 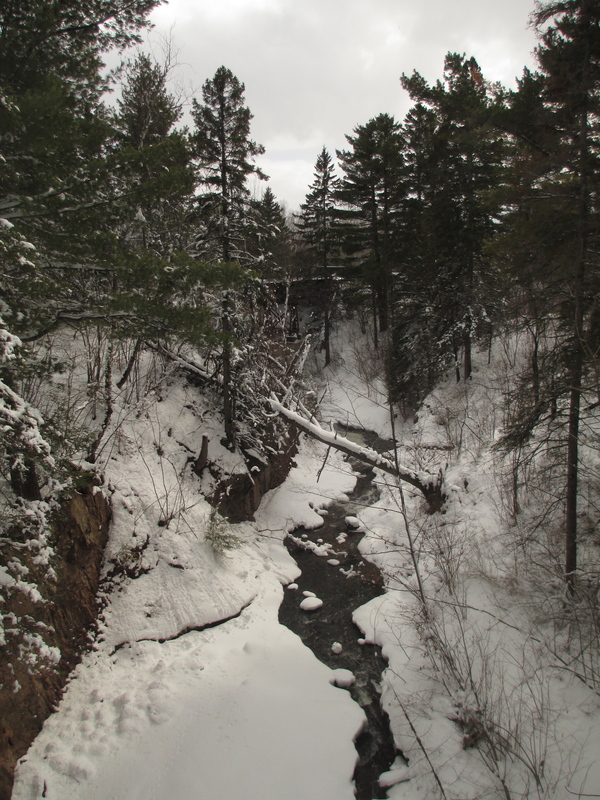 Water, like a ribbon of hope, flows through the snow within this ravine. The world isn’t completely frozen anymore, and all this precipitation will soon be rolling downhill.